The Currency of Love (2016) series are mixed media digital prints of the damaged and dead leaves of the common household money plant (epipremnum aureum) which Syed removes and collects daily for a month from his mother’s home in Karachi during her absence. For Syed, this act of removing leaves communicates to viewers his mother’s personal commitment to dutifully love and watch out for each of her four sons. He hypothesizes that his mother planted and nurtured four of these money plants in the place of her sons who had each left the country in pursuit of higher education and professional prospects. The money plant thus assumes the role of a ‘substitute’ for his mother to shower affection and care to, which also informs the basis for the digital print series Currency of Love (2016). 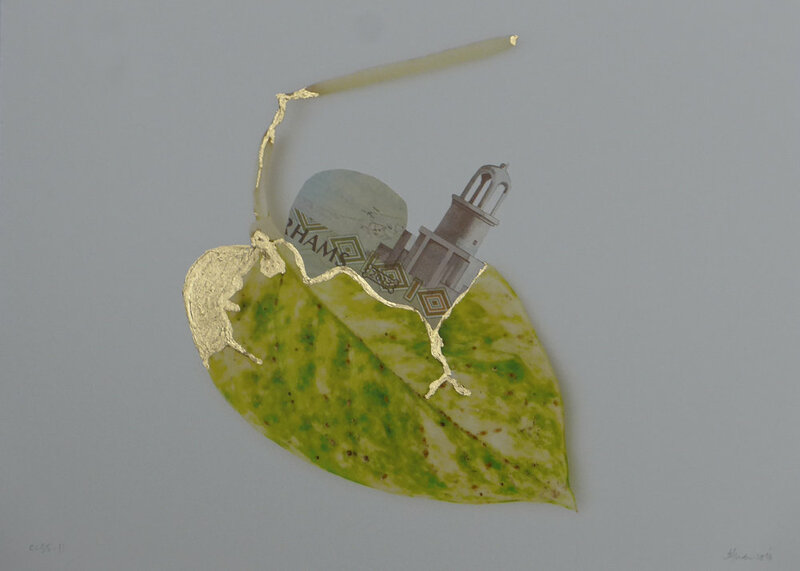 Syed then carefully uses 24k gold with new and old banknotes (some of which were given to him by his mother) in the delicate, loving and ultimately futile repair of a fallen and partially crushed leaf. His method recalls the centuries old Japanese art of Kintsugi used in the repair of broken pottery and ceramics with a special gold lacquer, that comes to fill, and define the beauty of the imperfection caused by the breakage. Syed’s act of preserving these damaged leaves speaks not only to the artist’s desire to preserve the evidence of his mother’s care for him, but through the transformation of these leaves into works of art lavished in gold, he simultaneously honours her delicate actions on his and his brothers’ lives. This is perhaps a quieter layer, arising from deep within the personal – almost as an extension of a conversation started long ago, activated years later in the absence of the one with whom it was begun.